If you think I’m talking fire… well, yes. My guys were out until 3 am, fighting fire in a steep and rocky canyon. This time things went perfectly and they hit it hard and fast, and kept it to less than 30 acres! Which means I’ll find something to do besides snuggle with puppies. 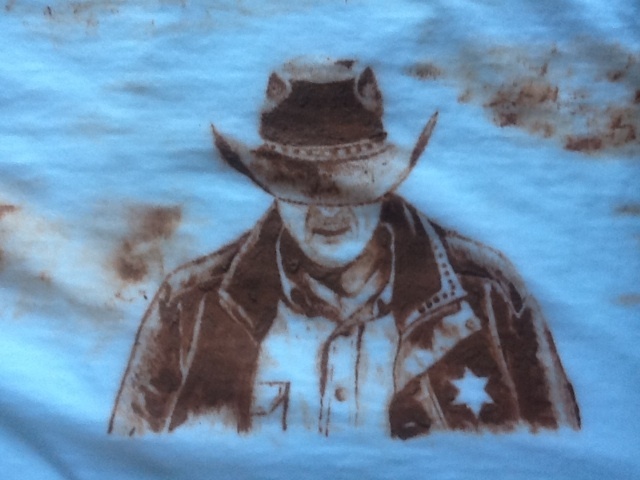 Walt Longmire (book and tv character) done in Red Dirt. The Longmire basket will be full of Wyoming goodies for the Library Endowment Fundraiser silent auction on Saturday. But, I couldn’t help myself! 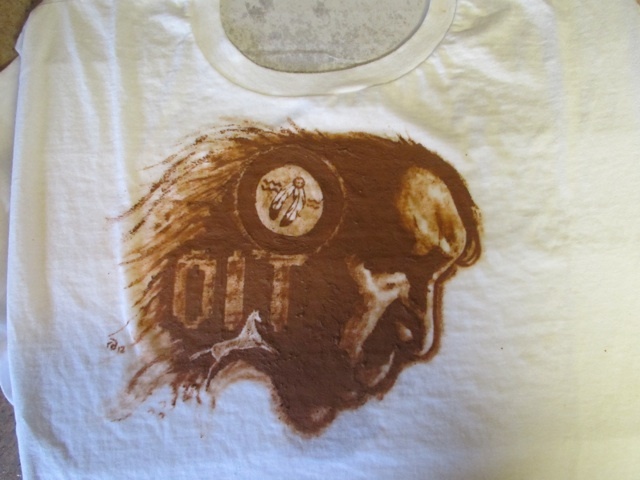 The other character of Henry Standing Bear (played by Lou Diamond Phillips) needed a tshirt, too! Obviously, this is the “before” picture… I’ll let it set overnight before washing the mud away… but Henry turned out just dandy, if I do say so myself! Had to throw in the TV show’s Cheyenne Reservation logo, plus the Red Pony… and OIT. If you don’t know what OIT stands for… I suggest you watch “Longmire” on A&E! I’m so happy with my Red Dirt Shirts… I’ll just have to make another one! July 10, 2010 You, You, You, Yucca, You! July 10, 2008 No entry.